UPDATE – Oct 12, 2015: A newer version (1.10.7000.0) is now included in Windows Insider Build 10565 which you can try out yourself by joining the Windows Insider program and being in the Fast ring. Among possible other fixes, it includes a full emoticon set and the Ctrl key doesn’t seem to be sticking. 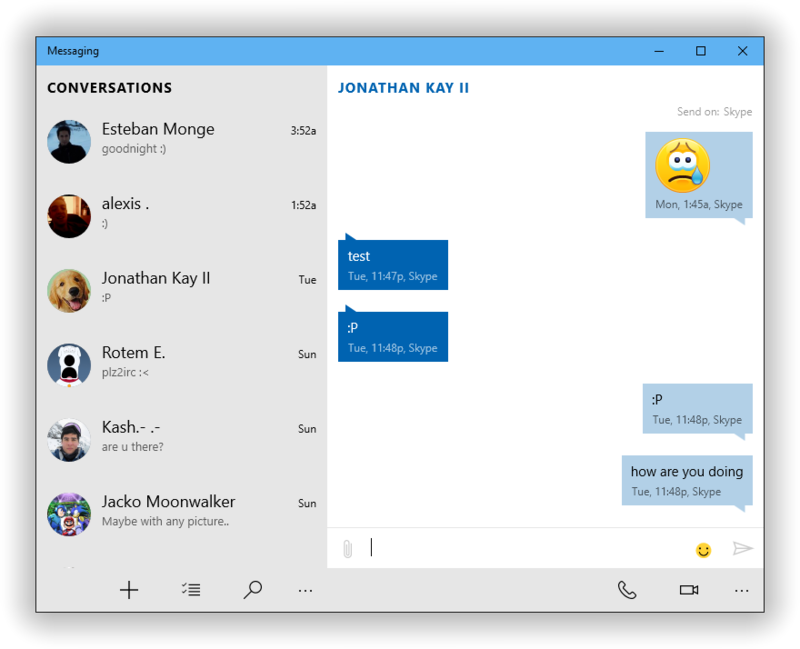 A version of Windows 10 leaked out late last week and contained within it was the long-awaited Windows Messaging Universal app. Supposedly written from scratch, it’s the successor to the Messaging app contained in Windows 8.0 and the Skype WinRT app previously available (since withdrawn). The executable is still named SkypeApp.exe however. The user interface is barren when you begin. But soon fills up when you start conversations: When sending messages, Messaging claims they’re being delivered on Skype, which is technically not accurate as I was signed in with a non-linked Skype account and speaking only to .NET Messenger contacts. I suspect Microsoft is trying its best to blur the difference. Messaging runs in the background separate from the user interface itself and appears as a second location in Messenger while you’re logged into Windows. After starting it for the first time, it took a while to start working initially and during usage, regularly disconnected. There was no indicator in the actual Messaging app when these disconnections occurred and although messages appeared in the window as being sent, they weren’t delivered until later. UPDATE: I observed later in the Event Log that the background SkypeHost.exe process was constantly crashing. This is most likely the cause of the disconnections observed in the client. Emoticons are extremely limited in this version, as well as being static and non-animated. Space bar and backspace buttons are added presumably for use on touchscreens. You can bring up Windows’ touch keyboard and use its standard emoji though. You certainly won’t be finding any custom emoticons here. The paperclip in the conversation window does not function yet, but I assume will be used for sending files when activated. This problem was reproducible on multiple machines, so I don’t believe this to be a hardware problem. At least I was able to successfully put in my name by copy/pasting it to the box. Toast notifications for Messaging have a textbox to reply back to sending contact and although you can type in them, I’ve found they work inconsistently. A significant problem with the notifications is that once they’re gone, there’s no little indication that you received a message. The Messaging taskbar icon does not blink and the only way you’ll know you received a message is by opening up the Action Center or the Messaging app. I’ll note that the notifications broke on all my machines after some light usage and never seemed to worked again, even after multiple reboots. Sending messages is a bit painful right now, as upon presssing Enter to send a message, it adds a new line to the textbox instead of just sending the message. You have to press Ctrl-Enter to actually send the message. Hopefully this will changed or be an option in later builds. Messaging has a select option and is the first of the built-in Windows 10 apps to support select all (a feature still painfully missing in Windows 10’s Mail app). You can select conversations to mute or delete, as well as Delete, Copy and Forward individual messages. When you forward the message, Messaging makes a new empty conversation with that same text and if you switch to another conversation, it will make a draft just like an e-mail client. Searching the Office 365 Directory didn’t seem to work yet however. If you push the + button in the corner, another window shows all your contacts and offers to search the Skype Directory. This doesn’t work either as it attempts to load a “skypepage” that doesn’t exist. Unfortunately you won’t find winks, custom emoticons, display names, animated display pictures, nudging, coloured text, customization, games, voice clips, or any other of the standard Messenger features in this application. I couldn’t find an Options screen, so there isn’t much in the way of things to tweak. Even compared to Windows Messenger that came with Windows XP, nevermind modern instant messaging clients like Facebook Messenger, WhatsApp, Viber, Telegram or Kik, Messaging still has a long way to go.